We talked about coal waste in the last post. In the spirit of the just wrapped up National Oceans Week, let's talk about the pollution critically endangering our blue earth. The shipping industry burns 300 million tons of bunker fuel per year. I'm not going to try to illustrate how many train cars that would be. Ships generate 15 to 30 percent of the world's smog-forming emissions. Bunker fuel burned by ships is 1,000 times dirtier than highway diesel used by trucks and buses. A single ship coming into harbor produces the smog-forming emissions of 350,000 new cars. More than one in 10 children has asthma in the world's biggest port cities. Researches are finding that the black soot from ship smokestacks settle on polar ice sheets and help cause melting. How much of this smog is generated by the U.S. nuclear submarines and aircraft carriers? Comparatively none. Although they have diesel backup, the ships primarily use steam powered by nuclear energy. Subs, for instance, are highly efficient and can go over 35 years before refueling on about a roughly 1 cubic yard volume of fuel. That cubic yard is power for air, water, electricity, heat, and propulsion for a large sub for several decades. Can you imagine if we could replace the cruise ships, oil tankers, and large shippers with nuclear powered steam fleets? Replacing 90,000 worldwide ships is equivalent to removing 31.5 billion new cars- that's over 5 cars for each person on earth. It would help save countless marine life, human life from asthma, cancer, and autoimmune disorders, help the critically endangered reef habitats, prevent a significant portion of oil spills, and save immense amounts of carbon emission and pollution which affects every form of life on the globe. 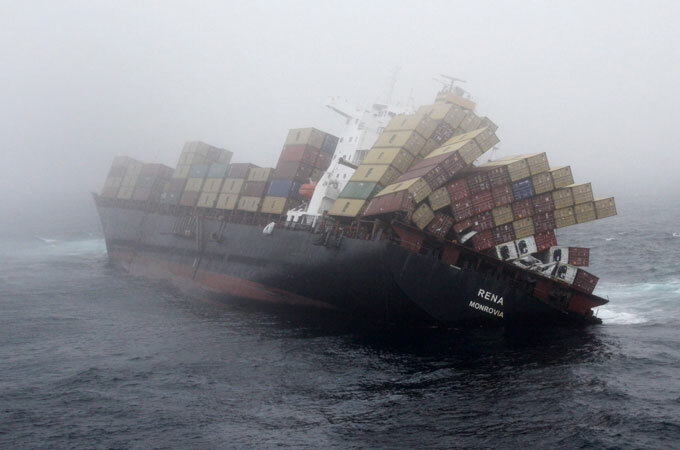 A large ship crashes into a reef and spills oil and containers. From Al Jazeera's article "World's Oceans in Peril"
Besides replacing Bunker Oil, using nuclear powered ships could mean faster flow of trade. The cost of running at full steam is the same as the cost of running at 1/2 or 1/4 steam on a Nuclear powered craft. (Or so close to the same as to not matter). This means that a cargo vessel can move much faster to their port thus making the goods they move that much cheaper. Great article! It's really crazy sad to think how much oil is wasted by burning it as a "base load" power source, whether for cities or for ships. One correction needed though, in the "How dirty they are" illustrations: "A single ship coming into harbor produces the smog-forming emissions of 350,000 new cars. That's more than a new car for every single person in the US." There are more than 300,000,000 people in the US, not 350,000. This error later figures into the estimation of how many cars worth of pollution could be eliminated by upgrading the trade fleet to nuclear power. outrageous, not sure how i missed the final three zeroes... i think i was jumping the gun on multiplying it by a number of ships, but i'm going to have to look back and correct it. Either way, the math still works out as far as 350,000 times 90,000 ships to reach 31.5 billion cars. thanks much for the comment and observation.